One of the best places for foreign nationals to look for jobs in Japan are career forums. Career forums strip out a lot of the traditional Japanese hiring practices of attending compulsory seminars, filling out entry sheets, and attending up to eight rounds of interviews before a job offer finally arrives. They concentrate employers in one convenient location, so you can gather information and talk with recruiters at a dozen companies all in one afternoon. The company that organizes the largest Japanese-English bilingual career forums in the world is Disco International. They run a fully bilingual website promoting all of their events at Careerforum.net (CFN). The largest of these events is the Boston Career Forum, held annually around the end of October. Some 150 companies attend this event, all big names like Panasonic, Goldman Sachs, Mitsubishi, and NTT, and they are looking for candidates with Japanese and English language skills to employ their English skills in Japan or Japanese skills abroad. Lists of attending companies tend to come out as early as six months before the actual event is held, and if you create an account at the CFN website, you can gather information on and send resumes to companies months before the event takes place--which I'd recommend, since companies schedule most of their interview sessions beforehand, leaving very little space for walk-in candidates. Some readers are probably wondering if it is worth it to fly all the way out to Boston for the event. If you have prepared well beforehand and scheduled perhaps six to ten interviews online beforehand, I say yes. There is potential here for foreign nationals if your Japanese is up to snuff. JLPT-1 or a high BJT score is a must if you are not a native speaker. But with that qualification, and a well-written English and Japanese resume, it is possible to line up interviews for jobs in Tokyo with major companies who are looking for native English-speakers. On the other hand, if you've never interviewed in Japanese before in your life, or if you've spent no time researching companies and practicing how you'll sell yourself to their recruiters, these events probably aren't worth the cost of a plane ticket for you. More than a few Western college students walk away from these forums with sour grapes because they thought walking unprepared into a Konami booth would land them a programming job. You need printed resumes, rehearsed interview answers, and, for any technical field, examples of your work to get anywhere. If you're just interested in seeing what a Japanese career forum is like, CFN hosts other events around the world, including London, Tokyo, and Los Angeles. If one of these locations happens to be nearby for you, it's completely free to register for and attend CFN events. But, for the big jobs, Boston is where it's at. By the way, all of CFN's career forums (and, really, almost all 就職活動 events in Japan) are formal-attire affairs. Dress up with a nice suit, including a white, long-sleeve button-down shirt, jacket, and tie. 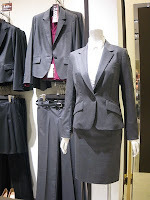 For ladies, a pantsuit is acceptable, but most Japanese women wear a jacket, blouse, skirt, and heels. The CFN website itself is a great source of further information on how to prepare for and participate in a career forum, and an awesome point of the site is that they translate everything across the site, word-for-word into both Japanese and English. Members (it's free to be one) can opt in to a newsletter about job-seeking tips and also access every back issue of that same newsletter (there's hundreds, if not thousands of them) on the CFN website.